through words. There have been a lot of wonderful comments about the beautiful photos in Joy. They are very appreciated and are passed on to the FlashBang Photography team that works so hard to make Joy look great. Susan and Danny Feller, the terrific mom-and-son team behind FlashBang Photography (see their ad at the bottom of this page), are photojournalists-intraining. They already were skilled in the more traditional forms of photography and were thrilled to take on the new challenge of learning photojournalism. Want a copy of those great shots of family, friends, once-in-a-lifetime events, and more that appear in Joy of Medina County Magazine? Photos from any issue can be purchased by calling 440-263-4502 or e-mailing sfeller1@neo.rr.com. 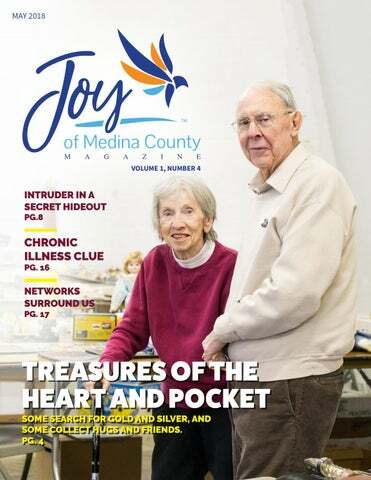 If you have not already, please share JoyofMedinaCountyMagazine. com on your social media pages so the wonderful people you are connected with can get a free subscription to the e-edition. PUBLISHER Blake House Publishing, LLC E D I TO R Amy Barnes P H O TO G R A P H E R FlashBang Photography A R T D I R E C TOR Ryan Burdzinski C O N T R I B U TO R S Bob Arnold Rich Bailey Paul McHam Kent Von Der Vellen MASCOT Rico Houdini OFFICE 330-461-0589 EMAIL Joy@BlakeHousePublishing.com JOY of MEDINA COUNTY MAGAZINE is published monthly by Blake House Publishing, LLC, 1114 N. Court, #144, Medina, Ohio, 44256. Send change of address cards to above. It is distributed for free in a print edition and as an e-edition that can be found by clicking on Free E-Edition at JoyofMedinaCounty. com. Copyright 2018 by Blake House Publishing, LLC. All rights reserved. Reproduction or use of editorial or pictorial content without written permission is strictly prohibited. Printed in the United States. Any unsolicited materials, manuscripts, artwork, cartoons, or photos will not be returned. Sharon and Tony Gordon have spent a remarkable 41 years sharing their treasures and gaining friends at the Medina County Flea Market. Crawling critters, slurpy spaghetti, hungry humans, beautiful baskets, jumping jazz, and more! Cam returns to the duct, earns a scream, finds a surprise, and gets in the middle of a chase. Wishes from those who attended The Children’s Center of Medina County Pinwheel Walk. From friends to monkey lamps, you will find it all at the flea market! If you can’t seem to get well, it is time to check for mold growth in your environment. Learn some tips on how to get a solid pre-approval for a house purchase. Strong buildings and successful networking share a common bond. ON THE COVER: Sharon and Tony Gordon hold court at the Medina County Flea Market. Once a popular dish in taverns, this is a great recipe for a now littlein-demand cut of beef. Twenty years and $147,772 later, the Medina County Women’s Endowment Fund is going strong and adding a new fundraiser with the help of a tree. An easy recipe for a little something sweet with a surprise ingredient. Time to get outside and enjoy the beauty of Medina County. From left, Sharon and Tony Gordon share a light-hearted moment with friend and fellow vendor Frank Armenio. Cy Levkanich, left, first time vendor at the flea market, discusses marketing strategies with Frank Armenio, who was a regular flea market character for eight years, but has now retired. Gas where she worked as a bookkeeper for 10 years. She married her first husband and quit her job to become a homemaker and mother to their daughter, Vanessa. It was after her first husband was no longer in the picture that Sharon and Tony met. Twelve years after Vanessa was born, Sharon and Tony added another daughter, Colleen, to the family. Tony started as a welder at age 14 and continued welding for 35 years. He also was an Army paratrooper during the Korean War, where they had him jumping out of planes over Germany. He said it did not make any sense to him that the war was in Korea, but they had him on missions in Germany. It is bad luck to count missions, Tony said, so he does not know how many he was on but says that he served as a paratrooper for almost three years before becoming injured when he landed from a jump. He says his knee has never been the same since the injury, and at the same time he downplays the danger of the missions. “It was more dangerous getting thrown out of a beer garden on Clark Avenue in Cleveland than it was jumping out of planes,” Tony said, with a twinkle in his eye, causing Sharon to give him a look of admonishment. She shook her head and mentioned that Tony loves to tell tall tales. He has fond memories of his days as the owner of Tony Gordon’s Barber Shop at 51st Street and Clark Avenue in Cleveland. By the time he retired, he had a shop in Cleveland and one in Brunswick. The shops were busy from morning to night, Tony said, with obvious pride. Sharon and Tony are planning to continue having a booth at the flea market for the foreseeable future. They are ready to share their knowledge and expertise and are looking forward to gaining new friends, with Tony ready and willing to spin a tall tale for listening ears. They will be there, in their usual spot, enjoying the adventure. Martin Warchola teaches Barb Kefalos, left, and Tammy Clark dog first aid with the help of a dog dummy at Wolf Creek Park, Wadsworth. Helping at the Feeding Medina County fundraiser were Spring Leadership Ball honorees, from left, Adrian Slovenec, Meriwether Harmon, Janiece Joyner, and Brooke Swain. ORMACO brought the Lempner Jazz Duo, guitarist Adam Sarata and saxophonist Tom Lempner, to perform at the Wadsworth Public Library. During Buzzard Fest at Brongers Park in Hinckley, Matilda the turkey vulture (called a buzzard locally) is a true friend and likes to provide shade for handler Jaime Mautz from the Medina Raptor Center. Matilda is 25 years old and weighs 4 1/2 pounds. A large crowd at the Galaxy in Wadsworth enjoyed the Breaking Bread on Bourbon Street fundraiser for Feeding Medina County. Matilda Kirchner accepts the challenge of crossing a rope bridge at Brongers Park during Buzzard Fest. Assisting her are Life Scout John Pesarchick, left, and Life Scout Matt Bearer, while Eagle Scout Robby Cerrito supervises. Turkey vulture Matilda shows off her 6-foot wing span. A wild turkey struts its stuff at Wolf Creek Park. Ken Gill Jr. backs up a Stormtrooper while his son, Ken Gill III, delivers some punishing blows on Medina Public Square. From left, Tom Richards, Becky Richards, basket weaving instructor’s assistant Emily Smith, and Belinda Charbonneau work together building baskets. Marlene Wolfe concentrates on making a basket at Wolf Creek Environmental Center, Wadsworth. From left, Sherry Ulrich and Ginny Venditti get the hang of basket weaving. Basket weaving instructor Betty Rettig gives encouragement to Rose Marie Tramonte. Two-year-old Andrew Sturgill and his father, Terry Sturgill, wait for the armadillo in Deb Brady’s hands to unfold at the Seville Library’s Zoomobile. Brady is an Akron Zoo education specialist. Deb Brady holds an armadillo for (from left) Makenna Lucas and Maisen Lucas while their mother, Amy Lucas, and Madeline Schuett enjoy the Akron Zoo’s Zoomobile visit to the Seville Library. Kelsey Hurley, Medina County Fair queen, and Joan Jellison share a laugh at Breaking Bread on Bourbon Street. Enjoying the festivities at Breaking Bread on Bourbon Street are, from left, Medina County Commissioner Patricia Geissman, Feeding Medina County Director Sandy Hinkle, and Lafayette Township Trustee Lynda Bowers. Leading other walkers back from the Pinwheel Walk to Prevent Child Abuse are Warriors for the Children members, Wheelz (left) and Crash. Annabelle Stanec (right), a Highland High School senior, held a spaghetti dinner fundraiser for the Leukemia and Lymphoma Society with help from friends and family, including her sister Abbey, on the left. Catch up on previous chapters of our story in the Joy Magazine e-edition! Go to JoyofMedinaCounty.com for links to past issues. from home, and they were messing with her things. I almost backed out, cut my losses and headed back to Devin’s. I could try to forget about Marissa and the bowling alley and everything, but there was no way that would actually happen. I held my breath and pulled myself through the gap in the rotary fan, crawling into Marissa’s room and making her scream bloody murder. A pillow hit me square in the face and fell in front of me. “What are you doing? !” she screamed at me. I froze, suddenly completely braindead. What was I supposed to say? I didn’t even know what I was doing myself. Not to mention, I’m pretty sure I was about two seconds away from getting stabbed with one of the knives on the wall. “Um, I’m here to help you,” I said, clueless as to what I meant exactly, but hoping I could wing it like I did most high school presentations I was forced to do. “Help me? With what exactly? And how did you even get in here? And-” She went off on me. Her questions got more and more aggressive and threatening until she finally stopped and frowned at me. “Well?” she shouted. I hadn’t realized it was my turn to talk. Stupid me wasn’t even thinking of what to say the whole time either, I was just staring at the wall of blades behind her, longing for their cold metal. “I-I…,” my mouth gave out and I stood there like a statue. An idiotic statue. “Wait. You’re Cam,” she said as if that explained everything. The nickname my little sister had given me when she was first learning to speak because “Cameron” came out more like “Can-ban” didn’t explain anything in this situation. At least, not as far as I was concerned. Luckily, Marissa was smart and put together the pieces of the puzzle quickly. Considering I was standing there dumbfounded, it was a good thing she did, too. “You left me the note, didn’t you?” This was the first question she’d asked that didn’t sound like a threat. I rubbed the back of my neck and chuckled awkwardly. “Yes,” I replied, staring at the floor. I couldn’t peel my eyes from the shiny metal floor, but I heard movement from her side of the room. As I looked up, I found her arms wrapping around my torso, and her head resting gently against my shoulder. falling asleep, and then all of a sudden think that you’re falling off a cliff to your death and you jump yourself awake and sigh, annoyed at your body and mind for teaming up together and playing tricks against you. Except I didn’t jump myself awake. I just fell. And fell. And fell. And I didn’t stop. I fell for hours, wondering if it would ever end or if this was oblivion. Then I hit the ground with a metallic clang that was so loud I thought my eardrums would burst. My head followed, bashing itself into the hard metal floor and making my whole body feel numb. I heard someone shouting, but I still couldn’t tell if I’d just been in a car crash or not. It was a limbo between a rock and a hard place, and to be quite honest, I wasn’t very interested in waking up and discovering which nightmare I was really in. another way…?” I couldn’t finish a thought. All I could think of was how perfect it would be for me to end up in jail at the end of all this. It’s not like anything else in my life was going right. Maybe prison was where I belonged. pulled the metal sheet back in place and crawled off behind Marissa Colt as she led me through a metal maze. I had no idea where we were going, where we’d end up, or even if we’d make it, and yet, in that moment, I didn’t really care. I felt safe with Marissa, and that was a feeling I wasn’t sure I would ever have again after my dad passed. Maybe, just maybe, I could trust Marissa. The jury was still out, but everyone in the courtroom already knew the verdict. I would like more scholarships for college. I want my volunteer job to become a paid one I want it t o b e warmer. My wish is not get h for kids to urt anym ore. The Children's Center of Medina County Community Pinwheel Walk to Prevent Child Abuse. Walk participants returning to Medina Public Square after planting pinwheels at St. Francis Xavier Catholic Church at 606 E. Washington Street, Medina. 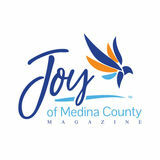 Want to be a part of bringing Joy to Medina County? Call 330-461-0589 to make your reservation now, before space is gone. Hello Friends & Neighbors Over 100 homes sold in 2017! Clue to a Cause of Persistent Illness by Paul McHam So, maybe you have been feeling sick, but it is really hanging on and you do not know why. It could be the flu or even just a cold, but then I am no doctor. I do know, however, that it is said that nearly 80 percent of all human ailments comes from the environment they live in. If you are feeling bad and do not know why, it may be that your environment is affecting you. Mold, for example, can have a negative human health effect. There may be tens of thousands or even hundreds of thousands of mold species. It is estimated that 90 percent are allergens and the remaining 10 percent are toxigenic. The allergens are serious because they can cause minor allergic reactions like sneezing, nose dripping, or coughing and clearing the throat, or they can cause asthma or even emphysema. Toxigenic molds can lead to a far more serious response like cancer, lupus, memory loss, or even organ failure. Maybe it is time to examine your home and business environments to determine if they are affecting you. Look for areas that may have gotten wet, such as the basement, under sinks, and in the attic and look for discoloration from the mold colonizing. Once you find discoloration, use a strong flashlight to expose small filaments growing out of the wet or recently wet material. You may have to turn the flashlight sideways against the surface to really make the profile of those filaments stand out. If you see filaments or what may look like hundreds of small beards sticking out from the surface, it is likely time to get a professional to render an opinion or, even better, to test it. Next month’s column will cover what makes a good professional a “good professional!” Paul McHam is a local expert on mold remediation. For more information, visit his website at http://myairxperts.com/ and his Facebook page Moldsporewars http://bit.ly/2E2Fj3y or call 330-331-7500. Bricks Fall Hard and so can Respect by Bob Arnold It is humbling to realize how networked the materials are that we live and work in every day. I was called in recently to help analyze and redesign the 226 South Court Street building in Medina, which housed the Gardener’s Cottage and recently had its three-story rear wall collapse. As an architect, I find it fascinating how we can take these common materials and put them into networkable products and forms. I am never more humbled than when I see these networks malfunction. Yes, the buildings we live and work in are networks! Our buildings are built upon the same principles our business and social networks are: the principle of bonding. All of the materials used in building a facility are carefully placed to respect their adjacent materials and they must bond together to accomplish their task to give you a comfortable place to work and live. Sometimes, just like in our business networking relationships, a building experiences a breach in the bonding capacity of some of its materials, thus the plight of the South Court building. The brick and mortar became compromised and lost their capacity to hold each other up, so down they went in a heap on the ground. When a business relationship loses respect for a networking partner, the relationship comes apart. I hate seeing this kind of thing happen to those of us in business, however, I also know that truly profitable relationships are built on a mutual bond, and we must work at them to see them flourish and continue to hold. I encourage you to let someone in your networking circle know how much they mean to you today. Don’t delay, bonds can look strong but fail instantly. Bob Arnold is the founder of ONward Networking and an international best-selling author. More networking tips and information are available at “Bob’s Pencil Points” blog at OnwardNetworking.com or by contacting Arnold at TheNetworkingPencil@gmail.com. Find a reason to say, “thank you,” to someone. A Legacy of Giving by Kent Von Der Vellen In 1998, three local women decided it was time for a fund that would focus on the needs of Medina County’s women and children. Jane Lang, Katie Horn and Gwen Rivers grew the Medina County Women’s Endowment Fund from the Medina County Community Fund by spearheading efforts to raise $104,000 to start the new fund, said Mary Isaac, MCWEF’s president. The local Women’s Health Fair received the first MCEWF grant in 2001 to provide child care and transportation for low-income women so they could attend the fair. In the 20 years since, the MCWEF has awarded $147,772 to 49 organizations, while the Akron Community Foundation provides administrative, legal and investment expertise. This year, MCWEF is honoring Lang and Rivers, both of whom died in 2017, and is celebrating 20 years of helping the community. The new Legacy Tree of Giving Campaign’s goal is to match the $104,000 that was initially raised in 1998. Donors are asked to donate $100 a month to MCWEF for a year. The first 100 donors will receive a photograph by Matthew Platz of the Legacy Tree, which is located along Route 3. When measuring brown sugar, packing it down always has seemed a waste of time. The brown sugar is never the same amount twice because the final amount depends on how firmly it is packed. It also makes it a large lump to add to the mixer, rather than the softer form prior to packing. My rule of thumb is to add a quarter cup extra of brown sugar and skip the packing. •	2 ½ cups flour •	½ teaspoon salt •	1 teaspoon baking soda •	2 sticks margarine •	1 cup brown sugar (do not pack) •	¼ cup granulated sugar •	1 tablespoon vanilla •	¼ cup sour cream •	3 eggs •	1 pound chocolate chips (be aware, a bag of chocolate chips is less than a pound) •	Optional: 1 cup coarsely chopped nuts, 14 ounce bag shredded coconut Preheat oven to 375 degrees. Use a balloon whisk or fork to combine flour, salt, baking soda. In separate bowl, use mixer to thoroughly combine butter, sugars, vanilla, sour cream, eggs. Add flour mixture. Add chips. Add nuts and coconut, if desired. Line baking sheets with parchment paper or with foil sprayed with non-stick cooking spray. Drop by teaspoon, approximately 2 inches apart, onto prepared cookie sheet. Bake for 10 minutes or until browned around the edges. Yield is approximately 5 dozen. Let's do it! Tuesday, May 1 Mother Goose Day http://bit.ly/2GkHk93 and Batman Day http://bit.ly/2p6R2Ug 10:30 a.m. to 2:30 p.m. American Red Cross Blood Drive; Medina Library, 210 S. Broadway Street, Medina. http://www.redcross.org/local/ ohio/northeast 3 p.m. to 7 p.m. American Red Cross Blood Drive; Grace Baptist Church, 3480 Laurel Road, Brunswick. http://www.redcross.org/local/ohio/ northeast 6 p.m. to 8 p.m. Gearheads: Robotics Challenge; Medina Library, 210 S. Broadway Street, Medina. Divide into teams, create robot. Must attend all four sessions. Register at https://bit. ly/2qjB7Ds 7 p.m. to 9 p.m. ORMACO: The Great Gatsby touring company performs; Highland High School Auditorium, Highland High School, 4150 Ridge Road, Medina. Tickets $15 in advance at all Medina County Buehler’s starting April 1, $18 at the door. www.ormaco.org , 330-722-2541. Friday, May 4 May the Fourth be With You: Star Wars Day http://bit.ly/2p4f2bj , Migratory Bird Day http://bit.ly/1wIvwE5 and International Tuba Day http://bit.ly/1nPT6L3 10 a.m. to 11:30 a.m. Master Gardener Coffee Chat; OSU Extension Office, Professional Building, 120 W. Washington Street, Medina. $5 For topic, more information, and to register go to http://bit.ly/2DDEYQw 5:30 p.m. to 10:30 p.m. Bluegrass Jam and Dinner; Lafayette United Methodist Church, 6201 Lafayette Road, Medina. Kitchen opens at 5:30 p.m., music starts at 7 p.m. Donation admission $3, dinner is additional donation request. Bring favorite dessert to share. Bluegrass bands welcome, arrive early to be scheduled. 7:30 p.m. Medina Community Band: Spring Concert; Highland High School Auditorium, 4150 Ridge Road, Medina. Free. Park, 8600 Hubbard Valley Road, Seville. Four to five mile hike at brisk pace. Dress for the weather. Ages 10 and up. Free. No registration. 9 a.m. to noon. American Legion Post 202 Paper Shredding Day, 620 N. Broadway Street, Medina. No plastic, no binders. Flags will be given proper disposal. Donations accepted. 10 a.m. to 2 p.m. Medina County Pet-Tacular! ; Pinnacle Sports, 313 Medina Road, Medina. Pet adoption, obedience classes, dog vaccinations, face painting, pet massage, and more. Free. 10:30 a.m. to 11:30 a.m. Cinco de Mayo; Brunswick Library, 3649 Center Road, Brunswick. Make a piñata, maraca, snacks. Grades kindergarten third grade. Register at https://bit. ly/2IIXoBw 10:30 a.m. to 12:30 p.m. Fabulous and Fancy Tea Party; Buckeye Library, 6625 Wolff Road, Medina. Dress in exquisite ensemble, enjoy teas, snacks. Grades kindergarten through fifth. Register at https://bit.ly/2qoxr2n 10:30 a.m. to noon. Laura Ingalls Wilder’s Farmer Boy Presentation; Medina Library, 210 S. Broadway Street, Medina. Stories, artifacts. https://bit.ly/2qkXU1P 11 a.m. Book Lovers Luncheon; Seville Library, 45 Center Street, Seville. Bring appetizer to share. Register at https://bit.ly/2GRyI9n 11 a.m. to noon. Hot Wheels and Trucks; Highland Library, 4160 Ridge Road, Medina. Stories, race cars. Grades kindergarten to fifth. Register at https://bit.ly/2GNye3Y Noon to 4 p.m. Computer Support, Medina Library, 210 S. Broadway Street, Medina. Help removing viruses and malware from laptops. Library tech department will assist. Ages 55 and up. First come, first serve. NO PHONE CALLS. 1 p.m. to 2 p.m. Cinco de Mayo; Brunswick Library, 3649 Center Road, Brunswick. Make a piñata, maraca, snacks. Grades fourth through sixth. Register at https://bit.ly/2JyP1cO 1 p.m. to 2 p.m. Mom and Me Scrapbook; Medina Library, 210 S. Broadway Street, Medina. Make scrapbook for mom, bring small mementos, photos. Register at https://bit.ly/2EC3KQC 5:30 p.m. Children’s Center Night at the Races; Weymouth Country Club, 3946 Weymouth Road, Medina. Doors open 5:30 p.m., heavy appetizers 6 p.m., post time 7 p.m. Tickets $50. Sponsorships and tickets http://www.medinacountychildrenscenter.org/ 7 p.m. Medina Chorus Spring Concert; Medina Presbyterian Church, 5020 Burgundy Bay Boulevard, Medina. Joy of Medina County Magazine | May 2018 Brunswick. http://www.redcross.org/local/ohio/ northeast 2 p.m. Wadsworth Community Choir Spring Concert; O.J. Work Auditorium, 151 S. Main Street, Wadsworth. 2 p.m. to 3 p.m. ORMACO Avenue Brass Quintet; Wadsworth Public Library, 132 Broad Street, Wadsworth. Free, but reservations urged, 330-334-5761. 2 p.m. to 4 p.m. OSU Extension: Nature Rocks! ; Wolf Creek Environmental Center, 6100 Ridge Road, Wadsworth. Workshop about butterflies with plant scavenger hunt and paint a suncatcher. Ages 6 to 12. Fee $6. Register with Ashley Kulhanek, 330-725-4911, Ext. 106, or e-mail kulhanek.5@osu.edu. Drive; Medina Community Recreation Center, 855 Weymouth Road, Medina. http://www. redcross.org/local/ohio/northeast 1:30 p.m. Summer Book Preview; Brunswick Library, 3649 Center Road, Brunswick. Penguin Random House rep shares new releases. Snacks, prizes. https://bit.ly/2HdWQq7 2:30 p.m. Candy Olympics; Buckeye Library, 6625 Wolff Road, Medina. Skittle sorting, candy taste-testing, races, more. Grades 7 to 12. 10:30 a.m. to 11:30 a.m. Sit, Stay, Read; Lodi Library, 635 Wooster Street, Lodi. Practice reading with Griffin, a trained therapy dog. Ages 4 and up. Register at http://bit.ly/2GkRKFI 4:15 p.m. to 5:15 p.m. Snack Attack; Story Time Room, Medina Library, 210 S. Broadway Street, Medina. Quick and easy recipes. Counts toward wellness Points. Grades 3 to 5. Register at http:// bit.ly/2Hum8g6 5:30 p.m. to 10:30 p.m. Bluegrass Jam and Dinner; Lafayette United Methodist Church, 6201 Lafayette Road, Medina. Kitchen opens at 5:30 p.m., music starts at 7 p.m. Donation admission $3, dinner is additional donation request. Bring favorite dessert to share. Bluegrass bands welcome, arrive early to be scheduled. Sunday, May 20 Be a Millionaire Day https://bit.ly/R4H42p Noon to 5 p.m. Wonderful World of Warblers; Susan Hambley Nature Center, 1473 Parschen Boulevard, Brunswick. All ages. https://bit. ly/2GR3hM9 2 p.m. to 4 p.m. Kitchen Gardens; Wolf Creek Environmental Center, 6100 Ridge Road, Wadsworth. Fee $20. Ages 13 and up. https:// bit.ly/2Hr9Iqt Call 330-722-9316 to register by May 11. Friday, May 25 Sing Out Day https://bit.ly/2IxUEXv and Towel Day (“Hitchhiker’s Guide to the Galaxy”) https:// bit.ly/2q9k2es Civil War Encampment; Spring Grove Cemetery, 785 E. Washington Street, Medina. 3 p.m. to 4 p.m. Crafternoon; Story Time Room, Medina Library, 210 S. Broadway St., Medina. Paint, craft supplies provided to create art. Grades 1 to 5. Register at http://bit.ly/2FE0Wno 5:30 p.m. to 10:30 p.m. Bluegrass Jam and Dinner; Lafayette United Methodist Church, 6201 Lafayette Road, Medina. Kitchen opens at 5:30 p.m., music starts at 7 p.m. Donation admission $3, dinner is additional donation request. Bring favorite dessert to share. Bluegrass bands welcome, arrive early to be scheduled. Monday, May 28 Amnesty International Day https://bit. ly/2He07mS All libraries are closed for Memorial Day. 10 a.m. Memorial Day Parade; Medina. Emphasis on Medina history. Submitting Calendar Events “Let’s Do It!” is a calendar of events sponsored or hosted by non-political, non-profit groups in Medina County. The calendar also is available online at JoyofMedinaCounty.com, where it is regularly updated with additional events. There is no charge to list an event in the calendar. To have an event listed, please send date, time, event name, location, cost of event, organization benefitting from the event (and hosting or sponsoring organization if different), contact name and phone number, website if available, and name and phone number of the person submitting the information to joy@ BlakeHousePublishing.com with Calendar in the subject line or you can mail the information to Attn: Calendar, Joy of Medina County Magazine, 1114 N. Court, #144, Medina, Oh. 44256. Calendar information will not be taken by phone. Treasures, clues, wishes, and so much more in our May issue to explore. Enjoy the wonderful stories of Medina County!